Every summer I pack up the minivan and take my children on a road trip. The four kids, a million fruit snacks and me. We take our crazy circus act on the road visiting family across the southeastern United States of America. Every summer, the road trip never fails to renew my faith in the wonder of the ordinary, the absolute joy of being with my children and the utter relief of not being over-scheduled. I love the open road. It is full of possibility and hope and promise and adventure. I am so much better at being a road trip mom than a get you to practice on time and remember where all of your games are and did you do your homework kind of mom. Give me a map, a minivan and a few kids with a sense of adventure and I am good to go. Luckily, I have a few kids like that. They are flexible and not too complain-y. Of course they fight with each other. The older ones roll their eyes, the little ones whine. They all have moments of being grumpy and dissatisfied every day---at home and on the road. But on the road I don't have to clean the house or remind them to pick up their rooms or pay bills or all the other stuff that comes with being a responsible, practical everyday parent. On the road I am the leader of our adventure, the captain of our ship of fun; not the over-protective bordering on Helicopter mom who messes stuff up all the time. "Where are we going next?," JT asked everytime we got in the car. "On an adventure," I replied everytime we got in the car. We went to the Parthenon replica in Nashville because Lucy is such a HUGE Percy Jackson fan. She wore her Camp Half-Blood T-shirt but we were too late to go into the museum. We plan to go back. It helps that we are driving to visit family, family that loves us and enjoys the circus for a little while. I appreciate that so much. Can you imagine our ship of fun steering it's way into your driveway? We are a really loud and rowdy bunch. But my sister didn't shut the door and hide and neither did my cousin. They opened their homes and their hearts. I felt the love and so did my kids. Love was our fuel on this road trip. The love of reconnecting with family, the love of swimming pools and diving boards and going for that flip, the love of a million cousins that we see once a year, the love of tradition, the love of puffy clouds and red dirt and mountains and kickball games and trampolines and being together. JT did approximately 46 flips off the diving board while we were in Kentucky. He was fearless. In six days we drove from Michigan to Kentucky for a couple nights to Alabama for one night and back to Kentucky and then back to Michigan. It was a whirlwind of hugs and kisses and family, and highway and rest areas and questions and laughter. On the way back from Alabama we made an impromptu stop in Nashville, Tennessee. The city was bustling with all kinds of music and characters and life. I decided we should stay the night. We went swimming in the hotel pool and had a picnic supper of gluten-free sandwiches on the floor of our room. After deciding who was sharing a bed with whom and brushing teeth we turned off the TV and I read to the kids. I started reading To Kill A Mockingbird to the older kids before we left on our trip, so that night in the hotel I continued with the story. The little boys fell asleep as I read about Scout and Atticus and Jem. The older two listened intently. I wanted that moment to last forever. Those perfect moments are part of the magic of the road trip. I'm hoping that happens next summer, but let's face it the days of all four kids huddled around a storybook are numbered. Next summer Peyton will be a true teenager and then Lucy will become a teenager and that's not a bad thing, it's just a thing, it's happening. I cherish these days with my kids all wanting to be adventurers together. I enjoy being with them and I am grateful for road trips that take us away from our wonderful but oh-so-busy lives so that we can have moments of magic and remember to find the wonder in the ordinary. 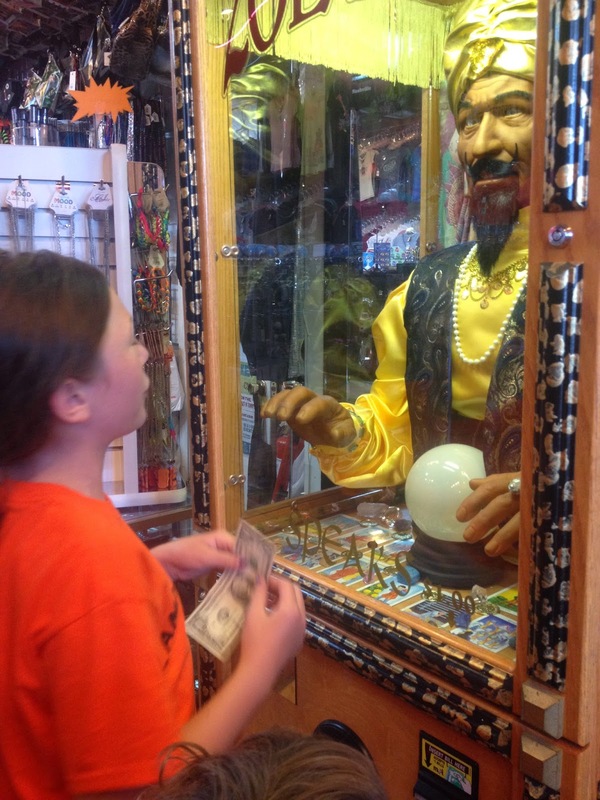 Zoltar will tell your fortune and Lucy totally fell for it. Check out some of our adventures. I also love being on the road: there's so much magic to be found! Oh your family makes me joyous! You're such a fun mom, loved your trampolining and singing. From a person always filled with wanderlust, your video gave me such warm fuzzies. I LOVE that you all were able to just "be" and have fun with whatever you chose to do. (I also noticed NO shots of people with their noses stuck in tech!) Keep doing what you're doing, mama. Those are the priceless memories that your kids will cherish for years to come. I agree that life is so much better when we aren't in the "routine" of it. I grew up never flying anywhere my entire childhoood because my mom thought it was important to see the USA from a car window. And THAT is my favorite child hood memory. Riding in the backseat of the car while exploring new towns, cities and states. We have been on the fence this summer as to where we will go on summer vacation and this post helped me realize that it doesn't matter the destination. The fun is getting there. Our go to answer for "where are we going" is to the moon. (Sometimes we'll get fancy and suggest the landfill for learning purposes). I am no good with maps, but I long for an empty road adventure. Fueled by love! I love that! Glad you had such a good time, road trips are amazing!! Once the kids are a bit older, we plan to take many. Love your photos too. I love being on vacation with my family. But I love to team it up with my husband. Maybe if it were my own country and I were staying with my own family, I wouldn't mind going solo. But I love to be led on the adventure rather than leading it. I want to go on a road trip with you! My kids were actually really good with driving, but I need to be more spontaneous. Also, they were pretty drowsy from dramamine for the first couple hours of each trip. How fun! My kids are pretty good during road trips. going on an adventure began with our 2007 July grandchild in the baby stroller - every Saturday - soon Seventh birthday - tap dancer, soccer student, Montessori - and a sister (grand-daughter) four years younger.